More than 122,000 Wisconsin men and women served in the military during World War I, in all branches of service and in hundreds of different units. However, the largest concentration of Wisconsinites served in the 32nd Division, which consisted of the Wisconsin and Michigan National Guards. Much like today, individual Wisconsin National Guard units were based in communities scattered across the state. When these units were called into federal service, it was a big deal for the civilians in the community as they saw their husbands, brothers, fathers, sons, and friends go off to war together. Tracking the whereabouts and well-being of these local men during the war became an important duty and it was often carried out by the local newspaper. For example, the Stevens Point Daily Journal and Gazette carried articles about local men that spanned their enlistment through their returning home over two years later. Articles tracked their movements and promotions, their training and conditioning, the visitors they saw and gifts they received, and their illnesses, injuries, and fatalities. Families shared letters that they received from their loved ones overseas, and the paper reprinted them. These articles provided the citizens of Stevens Point a lifeline to their loved ones during World War I. Today, they provide us with an incredibly intimate and detailed record of exactly what happened to a specific group of soldiers throughout their wartime experience. Hans and Ella Moen’s son, Russell, joined the Stevens Point National Guard company in April 1917. 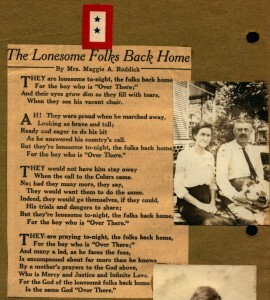 Ella clipped newspaper articles and, along with photographs and other ephemera, created a 180 page scrapbook. These pages detail her son’s service specifically, but also provide a level of detail about the activities of his unit that are invaluable to researchers today. 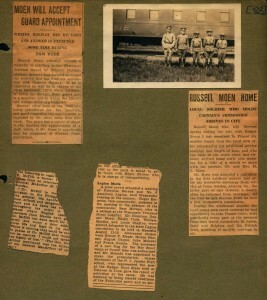 The articles in Ella’s scrapbook reveal that Russell Moen, a twenty-nine year old postal worker who was nicknamed “Pug,” was the first local man to volunteer and be physically examined (“found sound as a dollar”) on April 4, 1917; however, the official enlistment papers had not arrived in Stevens Point yet, so Moen had to wait till the next day. George Macnish, another local man, technically signed his papers before Moen, so the article split the honor of first to enlist between the two. From there, the scrapbook describes banquets, ceremonies, and parades in Stevens Point as the community celebrated and sent off their young men to Camp Douglas and then Camp MacArthur in Waco, Texas. Interspersed with the articles about the local men are some more general articles about the first American troops arriving in France and the overall effort there, which puts the activities of Moen and the Stevens Point men into context. As their training hit full gear, the scrapbook begins to include photographs that Russell sent home to his mother. Articles about the unit’s transition from a cavalry troop to Battery E, 120th Field Artillery reflect some uncertainty. George Arnett, who died aboard a ship while crossing the Atlantic, was eulogized as the first Stevens Point man to give his life to the war. Two scrapbook pages later, Ella included a telegram from Russell assuring her that he had arrived safely in England. Soon after, reprinted letters from Russell to Ella begin to appear along with articles that tracked Battery E’s movements through Europe. Censorship prevented extremely specific information, but the newspapers printed what they could, mixed with calls for liberty loan contributions. The scrapbook reveals that George Macnish, who shared “first to enlist” honors with Moen, died in France in July 1918, one of sixty Portage County residents to die during the war. Articles from November 1918 celebrate the war’s end and immediately begin tracking the homeward progress of Battery E, sharing rumored embarkation dates. Other articles start to summarize and celebrate the war record of Battery E and the 32nd Division as a whole, including the adoption of the Red Arrow as their insignia. May 1919 finally saw the Stevens Point men return, and items in Ella’s scrapbook detail the parades and celebrations that accompanied them. However, a separate article reveals that Russell did not return with his friends; rather, he chose to remain in France to help with inspection work at the U.S. camp in Brest. The remainder of the scrapbook contains postcards, photos, and other paper souvenirs that Russell sent home from his months in post-war France and several other countries he visited. 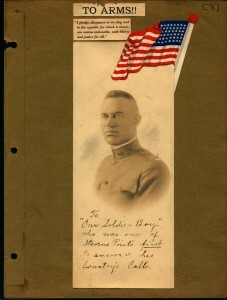 His eventual return home in September 1919 is well documented by articles, along with his decision to remain in the National Guard at the rank of Major. Ella’s scrapbook, lovingly dedicated to the service of her son, is a priceless memento for the Moen family. It is an incredibly valuable historical resource for scholars and researchers seeking to learn about an individual, a field artillery battery, or a Wisconsin community’s response to war. It also highlights the value of period newspapers, an often overlooked resource, for learning about those topics. The Wisconsin Veterans Museum is proud to preserve it, and the story of Russell Moen’s World War I service.